Cottage style and traditional bathrooms can make use of wood beadboard panels to help enhance the bathroom design. Create transitional looks by using it with modern tile. Bathroom paneling has been long used in traditional, cottage style and New England bathrooms to enhance the bathroom design. Making use of beadboard wainscoting instead of tile can create an old fashioned appearance that can fit in with today’s bathroom fixtures. Beadboard is a type of decorative wood panel with distinctive grooves running vertically on its surface. Typically installed as wainscoting, it can lend a farmhouse, traditional or informal look to a space. White beadboard panels are popular with many New England style bathrooms, although many homeowners will leave the wood in its natural finish, or just slightly stained to show the natural grain of the wood. Some woods, such as cherry, will darken and age over time when exposed to the warmth and humidity of the bathroom, lending a richness to the bathroom design. Wood beadboard panels are available in two styles. Traditional beadboard is made from tongue and groove boards which fit together in panels. Newer, less expensive options of beadboard are made from larger panels of wood that have been scored to create the look of traditional beadboard paneling. This second style of beadboard is typically comprised of a cheaper wood, and is therefore painted to enhance its appearance. There are several styles of bathroom design that can be enhanced by the use of beadboard panels. Cottage style homes, or Craftsman homes which have a great deal of gumwood and decorative wood moldings and paneling in the home, can continue the wood paneling into the bathroom to create a seamless look through the home. Traditional style bathrooms, with pedestal sinks or clawfoot tubs can be enhanced by wood paneling on the walls. In this case, painting the beadboard white can help to set off the rest of the design. Try using the beadboard with a mosaic floor in a traditional pattern, such as a basketweave or octagon and dot, and paint the beadboard a shade of white that is complimentary to the bathroom fixtures. 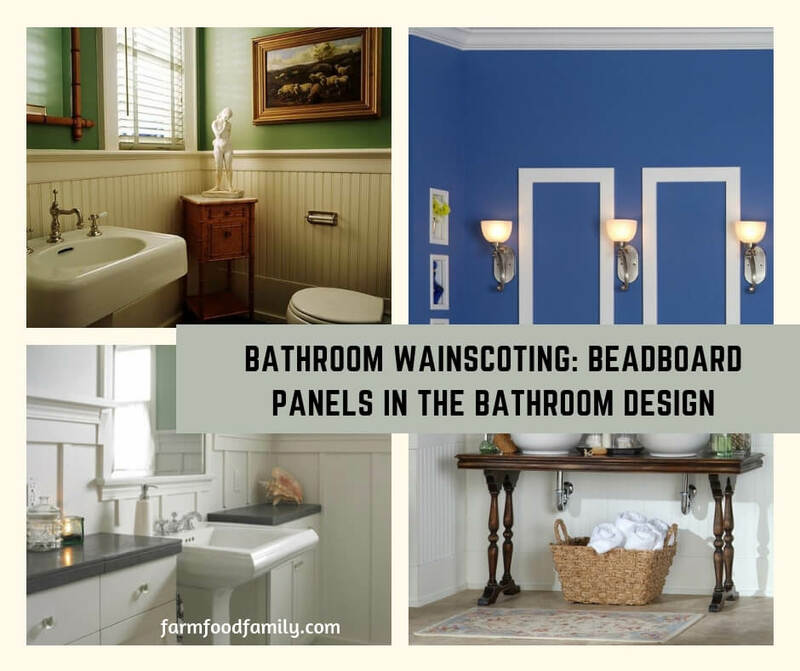 Many New England homes with small bathrooms and powder rooms may wish to use beadboard wainscoting to give an informal appearance to the bathroom. Create a transitional look by using a large format porcelain tile on the floor, and if there is a shower area, try using subway tiles accent with glass mosaics at eye level. This lends an eclectic feel that suits the style of the home, and the more modern appearance of today’s bathroom. Beach homes and vacation homes can also make use of beadboard paneling on the walls to enhance their cottage feel. Be sure in those cases to either use a latex based paint that can flex with the wood, or leave the wood unfinished to prevent cracking from the expansion and contraction of the wood in the moist air. To enhance the look of the beadboard, be sure to use a decorative wooden molding on top of the panels at chairrail height. Repeat the same molding at the join between the wall and ceiling, particularly if using wainscot paneling in a Craftsman or other style home which utilizes a great deal of wood molding throughout the home. Wooden baseboard moldings can also help to enhance the beadboard, rather than simply letting the paneling die straight into the floor. Using baseboards and chairrail moldings with the beadboard, and running a third molding at the ceiling can help to draw the eye horizontally around the room, visually enlarging it and enhancing the design. If using tongue and groove beadboard paneling, consider the type of wood being used. Woods with rich graining may simply need a coat a very light stain or varnish to protect them, to allow the natural beauty of the wood to come through. Cheaper woods, such as pine or MDF panels, should be painted to increase their appeal. Be sure to choose a paint color that compliments the color of the bathroom fixtures; using too bright a white may make the porcelain appear dingy. Finish off the design by using a rich, vibrant color on the walls above the wainscoting to compliment and show off the paneling. Beadboard wainscoting has been used in bathrooms for many years. Continue the tradition while updating the tile and style of the fixtures to create a bathroom that appeals on multiple levels. Consider the style of the home, the style of the bathroom, and the type of beadboard being used and create a bathroom with traditional and modern appeal.